For years, Logitech’s productivity mice have been among the best, with devices like the MX Master 2S helping to bring PC and Mac users together thanks to a cool software solution called, Flow which allows users to use the same mice with multiple computers at once. But for a long time, the company never had a keyboard that could deliver the same sort of style and quality its pointers delivered. 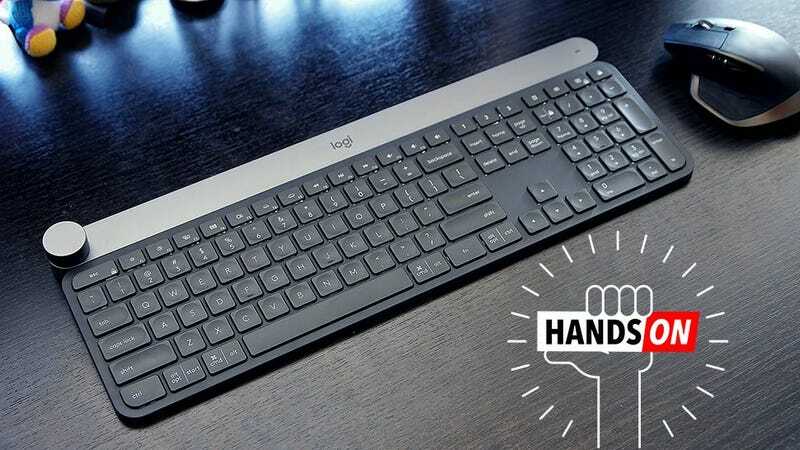 So despite a pretentious sounding name like Craft (the only thing worse would be to call this thing an artisanal keyboard) and not having mechanical keys that are all the rage among the youths of today, Logitech’s new wireless keyboard is a delightful piece of tech. The dual labeling on the keys should make switching between Mac and PC commands super easy. I’ve only used it for a few days, but its cushioned scissor switches are damn near whisper silent, which is a big plus for people who works next to inconsiderate assholes using keyboards with clackety Cherry Blue switches. (I’m kidding, kind of.) The keys also have a comforting indent and chiclet style layout which makes switching between laptop and desktop keyboards a cinch, even if you’re a MacBook user. And the backlighting has a special party trick thanks to its proximity sensor, which makes the keyboard light up whenever you get close. But the absolute best thing about Craft is that when teamed up with another Flow-enabled device like Logitech’s MX Master 2S mouse, it completely eliminates the need for archaic tech like KVM switches. Controlling multiple computers with the same input devices has never been easier. Logitech Flow even lets you copy and paste things across up to three different machines, and because Flow works over Bluetooth or Logitech’s own wireless dongle, there’s no cords to worry about either. The return of precision physical controls is well overdue. Down with touch controls!. Another nice feature on the Craft is the big dial on the top left. It can do normal stuff like adjust the volume of your computer, but it also works with Microsoft and Adobe software. Now you can use the dial to adjust settings in apps like Photoshop and Powerpoint. It’s the same idea behind the Surface Dial, and it gives you precise, granular control when you want to adjust things like contrast or opacity. The main drawback is that only seven apps are fully supported right now (four from Adobe and three in MS Office), though Logitech says more are on their way. And while important apps like Chrome don’t have any pre-installed controls either, you can create your own dial shortcuts on a somewhat limited basis. The low profile keys are a closer to what people use on laptops. But before the fawning goes too far, I must mention that the Craft isn’t perfect. It doesn’t have adjustable legs in back, so people who like a little angle to their keyboard dangle are out of luck. And if you choose to keep the backlighting on, in wireless mode, Logitech says the Craft will only last about a week, which is far less than some of its past wireless keyboard like the DiNovo Edge. (Turning the backlighting off extends longevity to about a month, but who is going to do that?) However, I do have to give Logitech props for fitting the Craft with a USB-C port for recharging instead of micro USB. It’s helpful nod to the future that a lot of other accessory makers seem to be ignoring. Lastly, there’s the Craft’s price: $200. That ain’t cheap by anyone’s standards, but it’s not that different than a high-quality mechanical keyboard, and the Craft has way more features. The Craft is due out sometime in October.